Every family establishes their own cherished traditions that defines their holiday celebrations year after year. It’s what everyone looks forward to and what helps reinforce your own personal, family values. 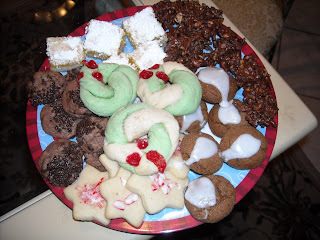 When our children were very small, I began an annual Christmas tradition of baking Christmas cookies and putting together cookie trays to give to friends and neighbors. In addition, the family would decide on 2 or 3 “special people” to ding-dong-ditch a cookie tray to. We would park a little ways off from the designated house and the kids would hop out of the car and quietly run up to the door, knock loud and fast, and run like the dickens back to the car. Out of breath, they would tell how they successfully stealthily delivered their treat without being caught. This small but worthwhile activity proved a source of much enjoyment and many happy memories throughout the years. Today, our children are all grown up and gone. Our daughters make me smile as they have decided to continue the Christmas baking tradition with their own families. Their kids aren’t old enough to ding-dong-ditch yet, but their little families are enjoying the continuing joy of making special holiday treats with love and delivering them to people they care about. 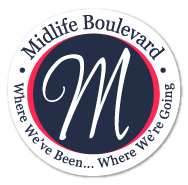 As empty nesters, no little voices are there to encourage you to continue family traditions. It is really up to you whether or not you want to go through the motions of the time and effort of these activities. And without a few extra helping hands around to get the job done, there actually is a lot more work involved to keep things going. Is it worth it or do you move on to simpler ways of fueling the holiday spirit? For me, it was :CARRY ON CARYN. I took a day off work and baked my heart away. And it did take the entire day as I was on my own. I like to bake 5 or 6 different selections; a few repeats from year to year plus a new delectable addition. This year I made the annual lemon bars, Chinese noodle cookies, wreath cookies, peppermint star cookies, Mrs. Smith ginger cookies, and white chocolate peppermint bark. The new addition was chocolate truffle cookies. 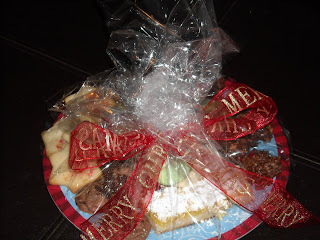 I carefully arranged them on festive holiday plates and wrapped them in cellophane with a nifty Christmas ribbon bow. Unfortunately, ding-dong-ditching didn’t sound too appealing to a couple of over-50 type people, so we just decided to knock and present our cookie trays face to face with a joyful holiday hello. The night we chose to deliver the cookies just happened to be the first day of the “Twelve days of Christmas,” so that made for a natural conversation starter for our door approaches. We delivered nine cookie plates and everyone appreciated our thoughtfulness. Continuing with this tradition certainly reaffirmed that family holiday traditions need to go forward, regardless the age or state of affairs of your current family configuration. That is what “Christmas Joy” is all about.